Maintenance kit with PrinterTechs refurbished fuser, WITH core exchange. M521 and M525 series. 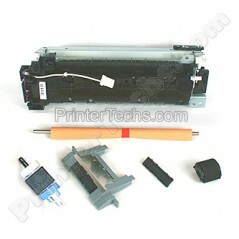 Maintenance kit with PrinterTechs refurbished fuser, WITHOUT core exchange. M521 and M525 series. Maintenance kit with PrinterTechs new fuser, WITH core exchange. M521 and M525 series. Will you be sending your used fuser core back as an exchange? An exchange purchase saves you some money and is environmentally friendly, see the yellow box below for fuser exchange terms.